How to Remove Water Stains from Fabric Upholstered Furniture in Boulder, CO 80301. From deHygieneique. For more articles like this, go to Cleancare Articles. Do not be alarmed when you see patches of light brown stains on your fabric sofa, possibly caused by a recent spillage from your glass of water. Water marks or water spots on fabric are commonly detected in the form of round rings left after a wet area has dried. It is often puzzling how can stains be formed by water when water is commonly used for laundry, bathing, washing dishes, etc. 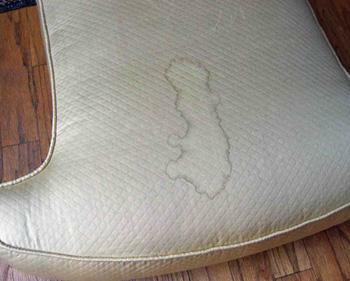 How to remove water mark on the upholstered furniture?1. Rule of the thumb – always try to blot as much of spillage when fabric is still wet from the original spill. Blot using a clean cloth until no more fluid can be pulled from the wet fabric. The more you blot, the higher your chance of not creating water ring on the fabric when it dries. 2. Blot the damp area with a clean cloth that has been dampened with vinegar solution. Blot gently from the outer edge of the stain towards the centre to prevent the stain from spreading. Do not rub as you may damage the fabric. To check for colour loss, you may consider blotting a hidden corner before “attacking” the damp spot. Precaution:Do not pour more water onto the wet fabric aiming to clean the cloth as you may cause newer and bigger water ring. Some fabric upholstery that are made of silk are not allowed to be cleaned using water because they form water mark when dry. You should contact a professional sofa cleaning service, such as Cleancare of Boulder, when in doubt. They have tackled thousands of difficult stains and made upholstery look like new. Call now and get 2nd piece of furniture cleaned for 1/2 price!